Had a great turn-out, pity the weather was ugly. Rain in the morning, bitterly cold temperatures in the mid-day and afternoon coupled with high winds! Several of the guys took apart the D.VII in preparation for Wheels & Keels. The fuselage needs some work and it needs to be done in the shop area so the wings and tail surfaces were removed and the fuselage trundled through the mud to the main shop. Tom Miller and Steve Freeman took copious notes on the disassembly process and put together a tool and needs list to take to Clear Lake to permit reassembly of the aircraft. 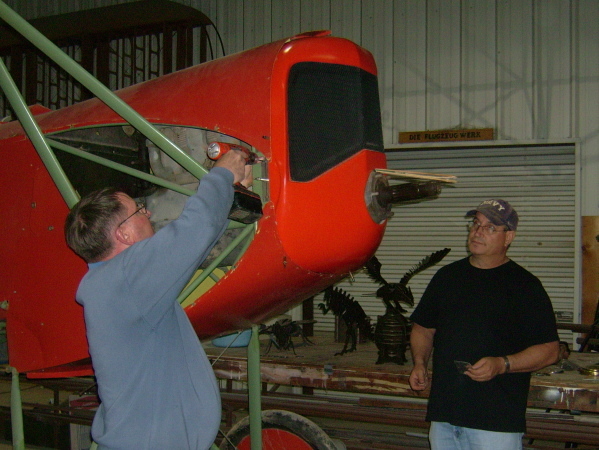 Later in the day, Steve, myself and Dave Miller worked on the nore bowl, getting that mounted to the fuselage. Steve was going to continue working on it the following day. Kurt Maurer received the prop templates donated by Achim Engels (Fokker Team Schorndorff in Germany) so we can carve an accurate full-scale prop for display purposes. Energy is being put into also cutting new prop hub plates so we have a more authentic looking prop hub to match our new prop! Dave Miller and myself - with an occasional assist from Terry Bledsoe - worked on overhauling the replica machine guns that came off the Triplane. Whoever put them together never intended for them to be taken apart! Part of the re-work is making them easier to disassemble in the future. The ratty wooden barrels have been replaced by aluminum tubing and the receiver frames (wooden) have been repaired and slightly improved. Carl Canga showed up with stencils for some PFM signs we want to create. Dave Miller had cut and painted a background on the sign boards. 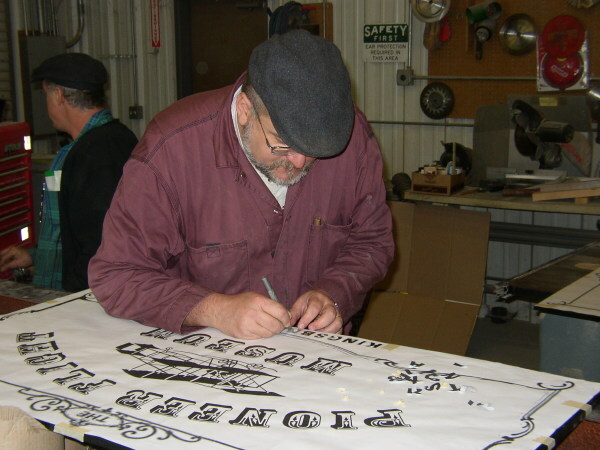 Dave Orloff started helping with cutting the letters and such out of the stencil. Big job that wasn't going very fast, so Carl took a lot of it home to work on. Carl designed the stencil and had them printed. Team Vehicles' day got off to a rousing start when Al showed up and relaized he'd forgotten some batteries and had to drive home and come back! But at least that allowed the rains to stop! John Bush started up the TT and drove it around some but then it stopped dead again and wouldn't restart. After being pushed back to the shop, new volunteer Cameron Whitaker and his brother Ian diagnosed the issue as a loose electrical connection in the wiring harness and fixed the issue in about 3 minutes according to Al. Cameron and Ian are both students at A&M, according to Al, and have duly passed their entrance exam and initiation into Team Vehicles! Al still has issues with the "Ruckstell gear" in the TT and is thinking about disconnecting it. Maybe he should have Ian and Cameron take another look at it? The Signal Corps truck was operated some despite the gloomy weather. Lynn made a late showing due to the weather but brought his battery charger which allowed two T batteries to get charged before the day was out. Terry and Al spent much of the afternoon fabbing up a fuel tank shell for Al's 1914 motorcycle racer project. The bike is looking pretty complete in its grey tires and all. 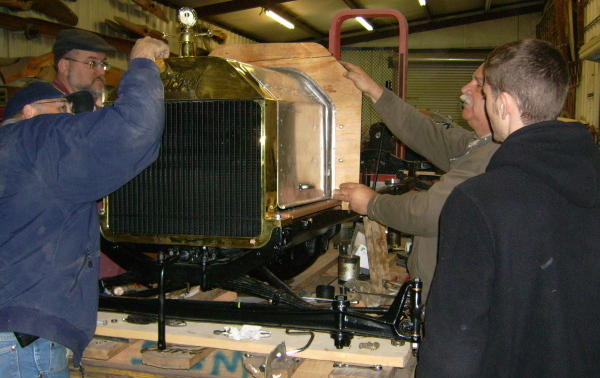 Roger, Dave Orloff, Dave's son Adam, and Dave Edgerly spent a large amount of time working on the new Model T Speedster project. Much of the firewall and engine cover work is nearing completion. Exactly what this gang worked on all day I have no real idea even though I was in the same room with them most of the time! Greg Solberg had completed machining the replacement brass nut for the Indian motorcycle and sent it to Kingsbury by special courier. This will replace the damaged and worn out original nut. One step closer to completion! We may well have a new museum HQ building at the April 3rd workday. A FEMA trailer has been purchased to serve as the museum's HQ and office. It should be on the property our next visit. We've started working the issues of water service, sewage, and power connections to the building, and we intend to do as much of that work ourselves as possible to keep costs minimized.